At the Clarinbridge launch are: Back Row L-R Imelda Cahill ( Strategic plan brand group) , Luke Spelman, Mícheál Donoghue (Galway senior hurling manager), Ger Conolin (Margin Gain Services), Brian Cox (club chairman), Kathleen Lynskey (brand group and juvenile club vice-secretary). Front Row James Forde, Jack D’Arcy, Dylan Kearney, Patrick Carty, Jack Deely, Oscar Fitzpatrick. 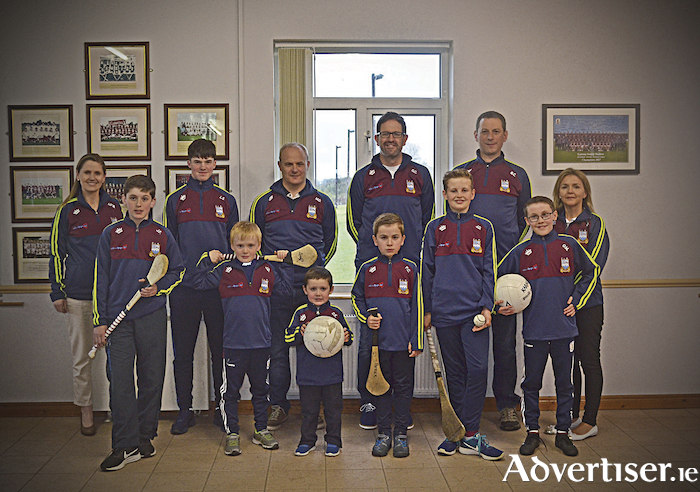 The Clarinbridge Juvenile GAA Club began the season in style with the launch of a personalised training top for every juvenile player and coach. This is part of an initiative to build the Clarinbridge GAA brand across the community and is one of the pillars of the ‘Bridge to the Future’ – a five year plan launched last year. And with a new local sponsor, Margin Gain Services, the local ties are being strengthened. Ger Conolin of Margin Gain Services says Clarinbridge GAA is the "bedrock of the local community". "The opportunity to support the club in a manner that helps the club to further strengthen its community-centred ambitions is a welcome and exciting development for the company." Mícheál Donoghue, Galway senior hurling manager said it was important to building the club identity, particularly with younger members. "It’s great to see the club identity growing in the community and especially the focus on the younger members of our club as they are our future." The logo on the front of the training top is ‘Opt for Life’. Founded by Joe Brolly, Opt for Life is a foundation that has national association with many clubs throughout the country and whose key objective is to raise awareness around organ donation. Clarinbridge GAA believes this brand association has a special fit with the club as the awareness of health and wellbeing is also a key pillar of the five year plan.